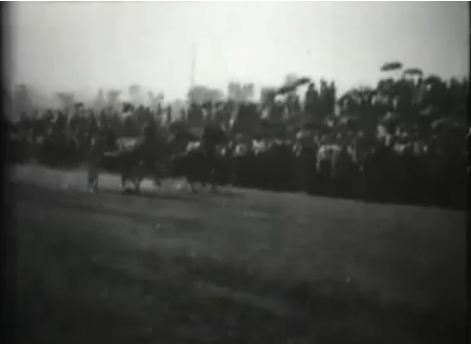 This early Edison Manufacturing Co. film shows part of the enormous crowd assembled on July 5, 1897, to watch the fastest harness horse in the world, John R. Gentry, compete against up-and-comer Star Pointer and Frank Agan for a purse of $6,000. The New York Times estimated that 25,000-30,000 spectators had turned out–the largest crowd ever assembled at Charter Oak Park up to that point. Hopes were high that John R. Gentry would break the 2.00-minute mark and set a new record. It was not to be. The film records the start and finish of the free-for-all pacing race, capturing Star Pointer’s win in an impressive 2:04-3/4 time.